This 101-meter long porcelain portrait depicts the entire history of Dresden through the men who built, controlled, governed and sparked new thoughts and ideas within it. It features Dukes, Electors, Kings and other leading figures from the arts and sciences. The 101 meters consist of 24,000 porcelain tiles from the German town of Meissen, and it's famous porcelain factory. This is the world's largest porcelain artwork and is quite the site to see. The procession ends near the entrance to the Church of the Holy Trinity where so many of the men portrayed in this mural are buried. The mural was first installed in 1871 and took more than five years to complete. But in 1904 the tile began to deteriorate, quite badly. It could not be repaired and instead was replaced. The new painter, Wilhelm Walther, used the sgraffito technique which allows for much more details to be added on the porcelain resulting in a much more pleasant image. 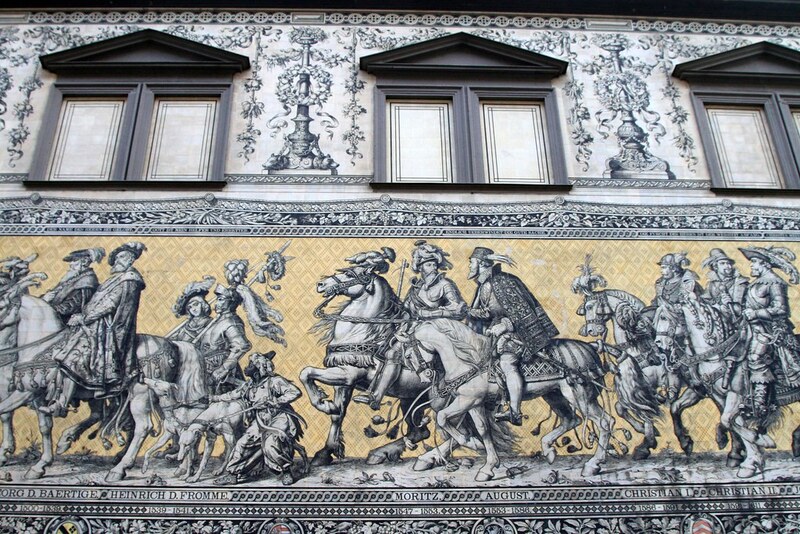 Perhaps it was the new, stronger tiles that allowed this mural to withstand the great Dresden bombing of WWII. It suffered minimal damage and was a beacon of hope to the people of Dresden after the war, that some parts of their great city were still standing. The Meissen porcelain was Germany's pride and joy, and it is no surprise those chose this material to create the mural for the 800 anniversary of the Wettin Dynasty. Across the mural, you'll find 35 noblemen, princes, dukes and kings. All of these men are seen on horseback. Accompanying these noble men are 59 scientists, artisans, craftsmen, children and farmers. The only woman portrayed in the mural is a girl in the group of children at the rear of the royal procession. The man leading the charge is Conrad the Great. He ruled from 1123 until his retirement in 1156. One of my favourite things about the mural is watching how the fashion changes along the way as we move through history. On the chest of Conrad are the arms of Dresden. The weapons that depict the lion of Meissen. The most important man on this mural is Augustus II, Augustus the Strong. You'll hear his name over and over and see his face plastered on dozens of statues across the city. Augustus the Strong got his name due to his physical strength he liked to show off at any opportunity. Once he took to breaking a horseshoe in half with his bare hands. History has proved that his horseshoe was previously very brittle, but nevertheless it impressed the people at the time. Augustus has high ambitions for himself and his city. He was a great patron of the arts and architecture and established the Saxon capital of Dresden as a major cultural centre, attracting artists from across Europe to his court. He collected hundreds of pieces of art from some of the greatest old masters and built a baroque oasis of lavish architecture in Dresden. But Augustus wanted more, and in 1697 he converted to Catholicism to take control of the Polish throne. You can see in the mural, flowers that are scattered on the ground. The horse Augustus is riding is rearing up and stomping on a large rose - the symbol of Lutheran religion that Augustus parted from to become ruler of Poland.